LAZY SUMMER DAYS of stitching sound good right about now and we have a number of tempting designs. Summer at Hollyberry Farm is a great one to start. This is part of a seasonal series from Stacy Nash. 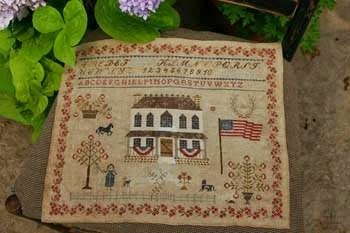 Just looking at this beautiful sampler takes you back in time. Another outstanding sampler for this week comes from Abby Rose designs. 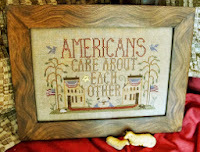 Home Is Where You Hang Your Needlework incorporates classy floral border with this favorite phrase for needleworkers. Third on the sampler list is Americans Care About Each Other. 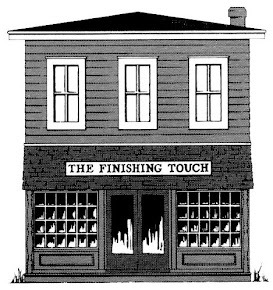 Classic Americana with a great message! It must be sampler week. How about spending an afternoon with this darling little kitten; this is a special project for the cat lovers among us. 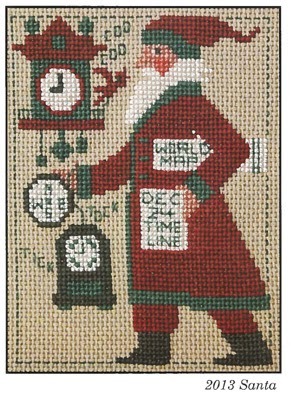 By the way, the 2013 Prairie Schooler Santa has arrived and he is as special as always parading with his collection of clocks. Stop in and select your summer projects. OMG Trunk Show is still in our shop. Don’t miss this one. Rosewood Manor is going home on July 27th.